You can organize migrations into as many groups as necessary and import an entire group or individual entities. The next step is to create migration configurations. Migrations are also created as configuration entities provided by Migrate Plus. They tell Drupal about the source and destination types and provide field mappings. Migration configurations should be placed in the config/install/ directory. 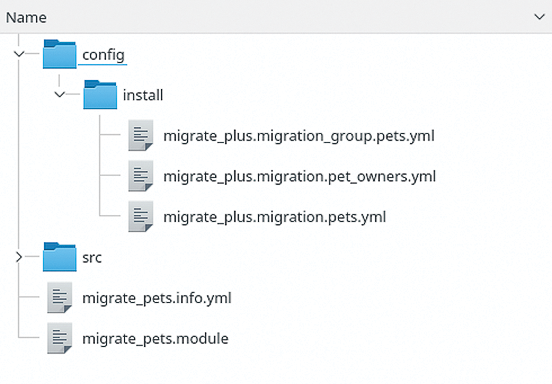 The pet owner migration is defined in config/install/migrate_plus.migration.pet_owners.yml, and the pet migration is defined in config/install/migrate_plus.migration.pets.yml. The module migrate_pets file structure is shown in Figure 5, and the full pet migration from config/install/migrate_plus.migration.pets.yml is shown in Listing 1. Figure 5: Migration configurations in config/install. Like the group configuration, each migration has a machine id and a human-readable label. These are used in migration lists and will be included throughout the UI when available. This migration is part of the pets group, as specified by the migration_group key. The group is optional, and the migration will be part of a default group if it is omitted. * Pet source from database. At a minimum, source plugins must implement the MigrateSourceInterface::fields() and MigrateSourceInterface::getIds() methods. The fields() method returns an array of fields available for mapping (Listing 2). Data ID fields are not necessarily migrated one-to-one in Drupal (pid from the source might not be the same pid in the destination). Instead, Drupal keeps a map of source IDs to destination IDs to track changes. The getIds() method returns the unique ID field and schema type for the source. In this example, each pet has a unique integer ID. SQL sources like the pet database must implement the SqlBase::query() method to define a select query used to load a source row. Use $this->select() (Listing 3) to query the source database configured in the migration (remember the shared source[key] field in the group configuration). You can optionally override MigrateSourceInterface::prepareRow() to make changes to row values before they are passed to field mappings. Most data manipulation should be done with process plugins in the field mapping, but prepareRow() is useful for lower-level manipulations, such as unserialize() or changing data types. In this example, we convert pet pictures to animations. Assume the PetSource::animate() method is implemented and converts a static image to an animated GIF. Row values are fetched using $row->getSourceProperty() and set with $row->setSourceProperty() (Listing 4).